by building applications & providing solutions using cutting edge technologies. 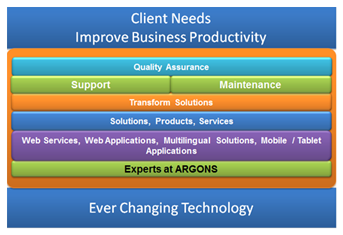 People who have an overall professional’s experience of more than 5 decades in the IT industry ranging from development, operations, quality, delivery and marketing are with Argon Solutions. We work with people, organizations by setting up smart teams who love challenges and think differently to help our clients succeed in achieving their goals in this competitive technology driven world.